Yours magazine is Britain’s leading magazine for the over-50s. It’s a friendly community where you can share stories and laughter, and find all kinds of advice. 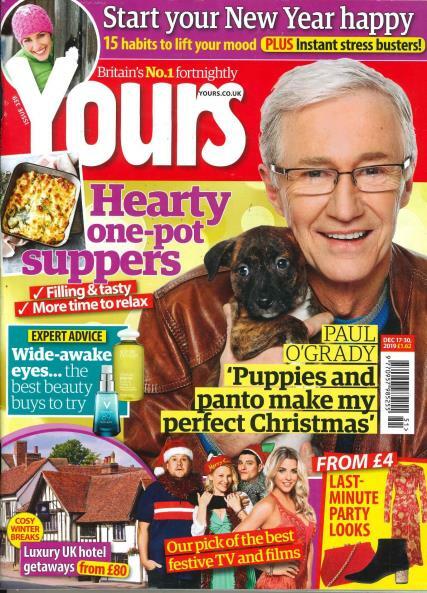 Yours magazine is packed with fascinating stories, news, celebrity interviews, puzzles, recipes and much more. Buy this for my mum she enjoys the fact that you can pick it up and put it down and just dip into it. Purchased as a gift for my Mother, who enjoys the variety of subjects in the magazine. My mum likes the magazine but I dont read it. The Yours Magazine is a fountain of information even 4 us here in New Zealand and my Mother of nearly 90 years old loves reading the Yours Magazine. My favourite is the knitting and cooking and the stories of yesteryear also the helpful information. Especially I love the ads 4 the walk in Baths, I want one dearly, 4 Mum 'n' Me, but alas we cannot buy them here. Well we have a national magazine here, but the Yours certainly wins hands down. I most certainly would love 2 win a subscription 2 the Yours Magazine, but if I don't I will be putting a subscription in 4 it anyway.